Beautiful colors! Soft fiber! Looks like I may need to order a little something from this shop soon! The Chicks with Sticks Etsy shop can be found at http://sprouty25.etsy.com. Note: Photos are from sprouty25's Etsy site. 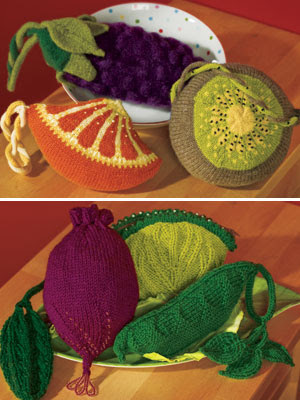 I don't know if anyone got their yarn pr0n this week, but I got the KnitPicks Catalog and oh boy do I want to knit one of these quirky little kits! Seriously? A bag that looks just like an orange slice? That is about the cutest thing ever! 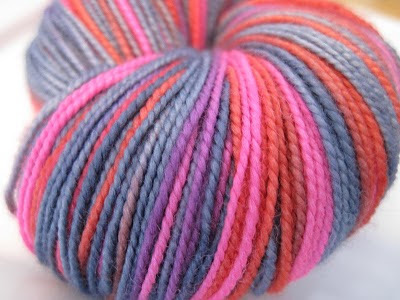 Photos taken from the KnitPicks website. Just sayin, these things are making their way to my queue right now! You can get your kit from KnitPicks for $29.99. I recently mentioned on the blog that I started a new group on Ravelry called Kimi's Kids. You can read more about it in this post here. An Umbilical Cord hat. 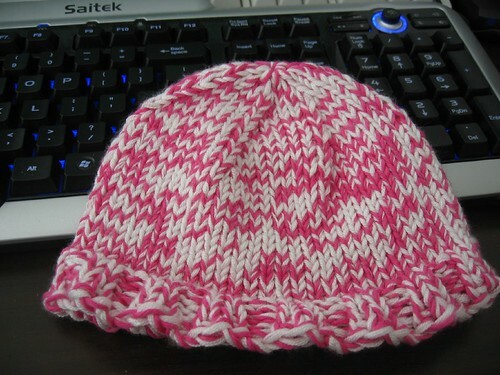 One of my absolute favorite baby hat patterns ever. So far so good. 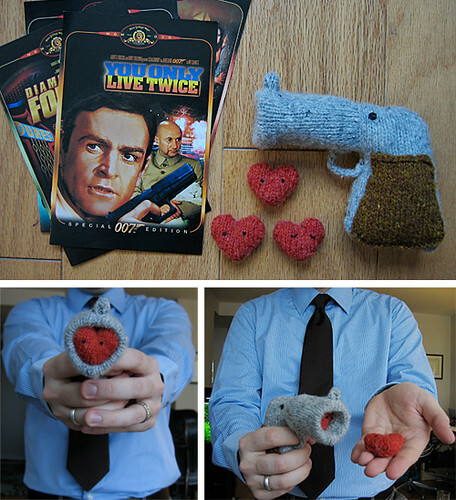 I have lots of people knitting their hands off for this project. I always knew Ravelry was super full of super awesome people, but I never thought I would get the response I did for this project. Makes me so happy. Keep those baby items coming! If you would like to join in the baby knitting (or crocheting!) fun, you can either join the group on Ravelry or just knit any baby item your little heart desires and then email me at jenATknittinglikecrazyDOTcom and I will give you my address so you can send it to me. I will then be giving them to Kimi to give to the women in the class that she teaches. 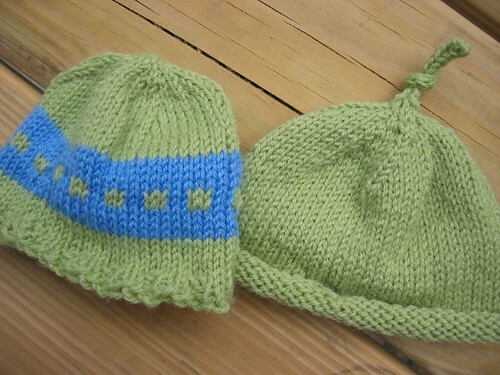 This week's Sunday Night Etsy Site takes me to a site that has some knitting themed goodies. And, I don't know about you, sometimes it's not just about the knitting supplies, but also the random knitting themed stuff you can find. I mean, seriously? 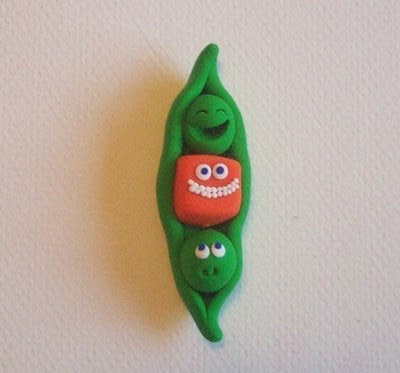 A knitting peapod magnet!? Yes, please! Polpette Clay specialized in clay magnets (and Christmas ornaments too!). 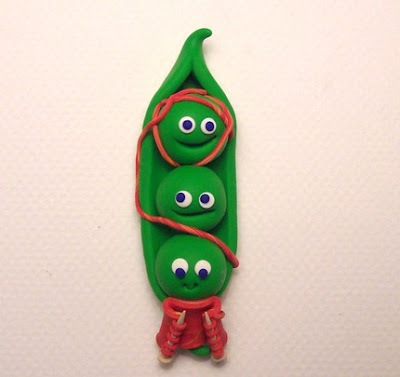 And, she does custom orders (I know this because a couple of years ago I purchased several knitting peapod ornaments at once). 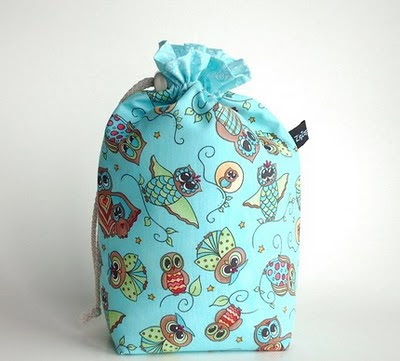 She ships things quickly and carefully and her products are amazing (and inexpensive!). What's not to love!? Polpette Clay can be found at http://polpetteclay.etsy.com. Note: Pictures are from Polpette Clay's Etsy site. I like to knit lots of things, but if I had to try to put myself into one category, I would still say that I am a sock knitter. And so it goes there are lots and lots and lots of sock patterns in my Ravelry queue. Here are just three! Photo from toomuchwool's Flickr Photostream. 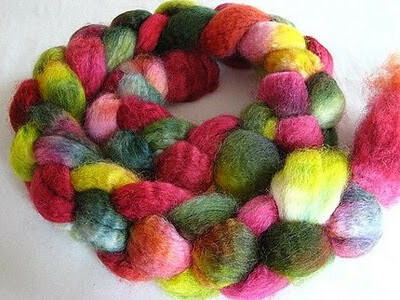 I have seen lots of these around Ravelry and the blogosphere. Love them all. You can get the pattern as a Ravelry download for $5.00. Photo from realknitfreak's Flickr Photostream. Clever name for a pattern that is supposed to prevent pooling. I think these socks look so cool. 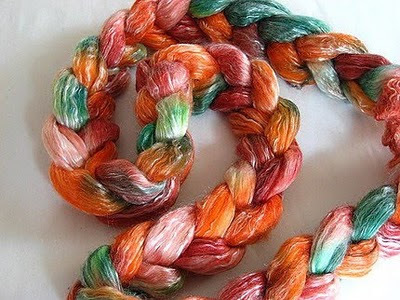 And, I think they are perfect for someone like me who loves to buy the crazy variegated yarn and then never knows what to knit with it. This pattern is available for free on knitfreak's website. These are super cute too. I love that stitch patter going up the side of the leg! This one is available as a Ravelry download for $6.00. Well, the Ravelympics are in full swing. While I haven't been able to watch as much of the Olympics as I would like, there has been some Olympic knitting going on here. I have been diligently working on my Baby Surprise Jacket: There is something I just love about the BMFA colorways and garter stitch. This one really is rockin' my socks. 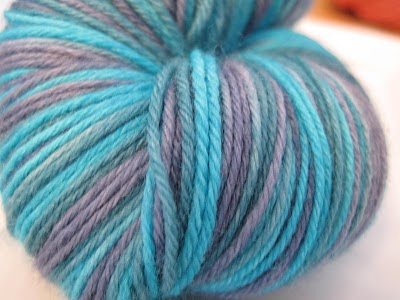 It's the colorway Downpour, in case you might be wondering. So, how's your Olympic knitting going? Well, it's time for another Sunday Night Etsy Site. This time, it's ZigZagStitches! 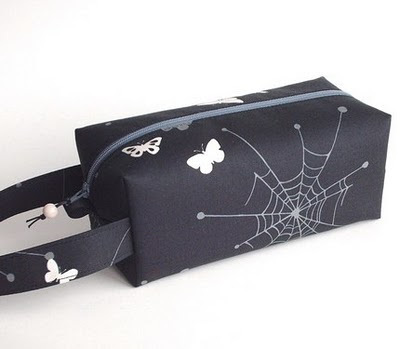 Want your own project bag? Visit the shop at http://zigzagstitches.etsy.com. Note: Pictures are from ZigZagStitches Etsy site. I bought this one a long long time ago (it's been at least two years this one has been marinating in the stash). At first I thought I wanted to knit some Rotating Rib socks (after seeing Yarn Harlot's pair out of this colorway awhile back) but then I started thinking about a Baby Surprise Jacket for the baby cooking in my sister's uterus and I saw some very pretty ones made out of Downpour on Ravelry, and I knew it was meant to be. So there you have it. My Ravelympics plan: A Baby Surprise Jacket out of Socks That Rock. I think it is going to be just fantastic. Well, with Valentine's Day being this weekend, I thought it would be appropriate to share some patterns that are fitting for such a holiday. Photo from MochiMochiland's Flickr Photostream. I mean, seriously!? A luvgun!? That is just flippin' awesome. I have no doubt I will knit this someday. It just has to happen. This is a Mochimochiland pattern and is available for download on Ravelry for $5.00. Photo from MochiMochiland's Flickr Photostream. And, if you have never checked out these Flickr pics, you should. Her stuff is AMAZING. 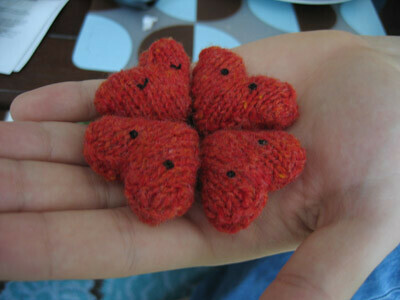 These hearts are also by MochiMochiland and the pattern is available for free here. 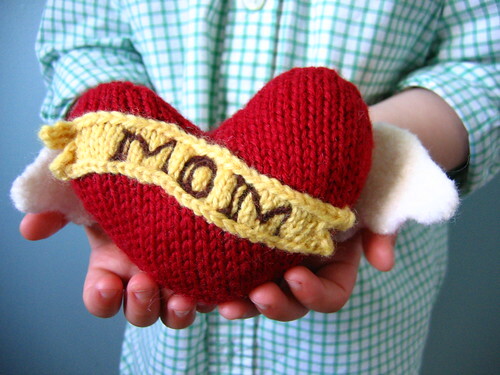 You know you would love to give that to your mom. You can get this Winged Heart Tattoo pattern by AnnyPurls as a free Ravelry download. So, what's new in your queue? Hope you have a nice Valentine's Day! This week's review brings me to a new sock knitting book: Sock Club by Charlene Schurch and Beth Parrott. The first thing that grabs me right away are those socks on the front cover. I definitely want to be knitting some of those! 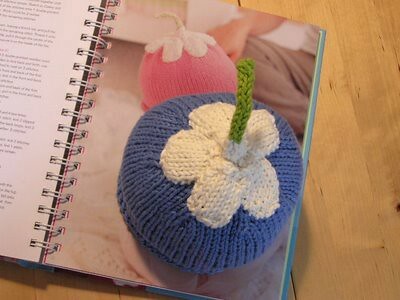 Once I opened the book, I found there were many more patterns that I want to knit. In fact, I counted ten patterns that on first glance I wanted to knit (Serendipity, Low Country Light, Blush, Beaded Lattice, Ariel (this is the pattern on the cover), Rainbow Swirl, Wavy, Rainbow Over Lahaina, Reims, Acorn Stash. That's a lot of patterns to love in a book of 23 patterns. Other than maybe Cookie A. 's Sock Innovation book, I can't think of another sock book I have ever seen that I have wanted to knit so much out of it. That's saying a lot, because I am kind of picky when it comes to sock patterns! 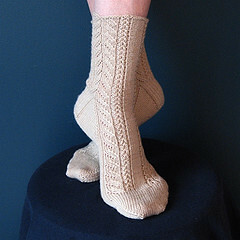 In addition to all those patterns, there is also a few pages on making socks your own size. I always appreciate this kind of this with sock patterns, because I don't think my size 11 feet are going to be shrinking any time soon! Some of the details this section goes into are changing the number of pattern repeats and adding a small motif in between pattern repeats. I also appreciate that the patterns give directions or options for making the socks bigger. After all the patterns in the book, there are a couple pages with techniques, useful info, and foot measurments. I was so happy to see the foot measurements in the book. I mean, when you are trying to surprise a friend with birthday socks, it kind of ruins it if you take a tape measure to his or her foot. Hooray for the chart that at least gives you some average numbers to shoot for when knitting those gift socks! The other thing that is making me totally in love with this book is the fact that several of the patterns featured indie dyer yarns. Makes me hopeful that someone will be designing sock patterns for books with one of my yarns one day! 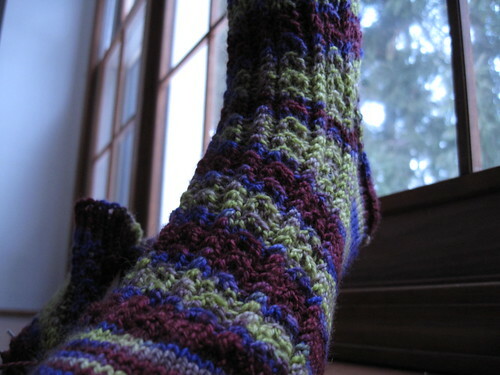 Sock Club is published through Martingale and Company and has a list price of $24.99. You can get yours on Amazon for $16.49. I definitely recommend that you do. Well, it's Sunday night, so you know what that means! It's time for another Sunday Night Etsy Site. 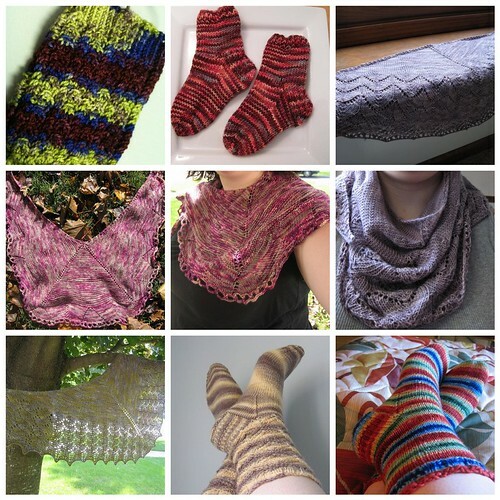 This time here are some lovelies that you might find on Fat Cat Knits: I have ordered roving from Fat Cat Knits on a couple different occassions. 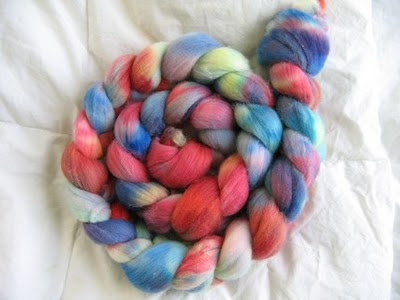 Both times, super fast shipping and the stuff was so so nice and soft and dyed so well. Some of the color combos are ones that I would never dream of putting together and they always look so great. Fat Cat Knits also has some patterns. Those look super cute too! Note: Pictures are from FatCatKnits' Etsy Site. As I talked about at the beginning of last month, I made myself a Stash Sock of the Month Club. I did well last month and managed to knit my Bellatrix socks in just about five days. 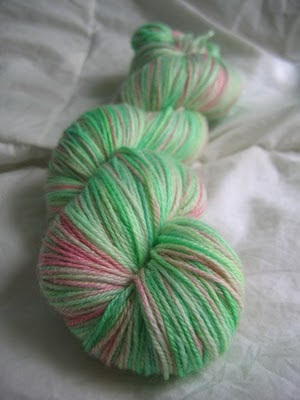 This month, I am confident I will complete my Stash Sock of the Month Club kit, just probably not in five days! So, what did I pull out of the closet this month? Why it's some Froot Loop socks! This pattern is a free one on Knitty and one that I had been wanting to knit for a very long time. And the yarn? It's some Adorn Sock (I think, it unfortunately did not have a label when I purchased it at Sock Summit) from Three Irish Girls in the Ciara colorway. I have been working on these for about a week now. But, as you can see above, the second sock has been started, so I think I will be able to finish these puppies before the end of the month! So, anyone else make a Stash Sock of the Month Club for themselves? If so, how's it going? 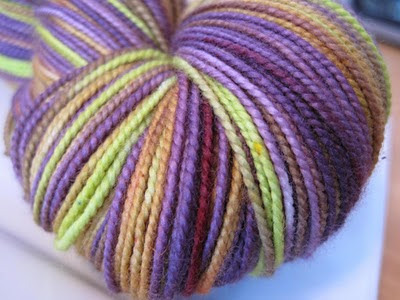 Photo from sunshineyarn's Flickr Photostream. This hat is just so adorable to me. 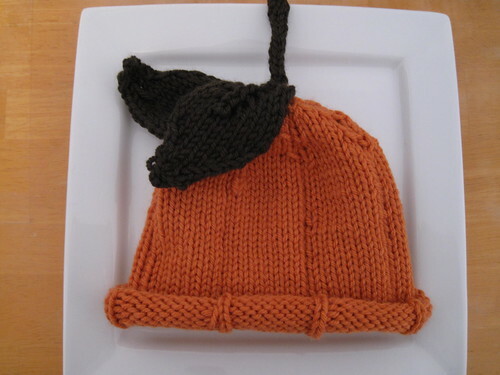 I don't care whether my sister has a boy or a girl, I am going to need to make one of these! This pattern is by Susan B. Anderson and is available for free here. Photo from jessloring's Flickr Photostream. I plan on knitting this hat in red and make a little strawberry hat! I think it just so so adorable. 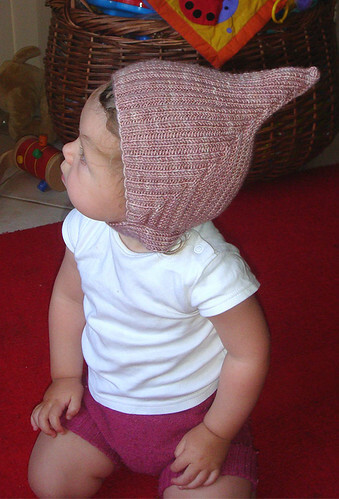 You can get the Berry Baby Hat by Michelle Sabatier for free on her blog here. So there you have it. Some more very cute baby patterns. What's new in your queue? So, I have this friend, Kimi, who I have known since college. Her and I were two of the founding members of the Chem Clique while at Loyola. While I have gone on to test wastewater for a living, Kimi has gone on to become a doctor. Currently she is practicing medicine at a clinic in the Chicagoland area. Kimi is teaching classes at the clinic for women who are expecting children. Many of these women come from low income families. Anyway, me and some of the ladies in my knitting group are going to be knitting stuff in the next month or so to give to Kimi so she has something nice to give to these women at the end of the class. But, then I got to thinking. I know she teaches this class at least a couple times a year, and it would be nice if we could continue to give her stuff to gift to these women. Enter the Ravelry group. So I have started a group on Ravelry called Kimi's Kids. Basically, if you are willing to knit a hat or something, just join the group and knit away. Then, when it's done, you can Rav message me for my address and you can send it along to me. I will make sure Kimi gets them. And, if you are not on Ravelry and want to send a little something my way to give to Kimi that would be cool too. When you are finished with your item you can email me at jenATknittinglikecrazyDOTcom and I will send you details on where to send it. It's time for another book review. This week I took a closer look at Vintage Baby Knits. It's a book I had asked for Christmas and I have to say, I am sure glad I did! Photo from thewoolshack's Flickr Photostream. I mean, c'mon, that has to be the cutest thing ever! There are also lots of other things in the book I would like to knit, including the Jasper Diamond Hoodie, the Frances Nursing Shawl, and the Ducky Onesie (you can see pics of these projects on the Rav page here). If you love vintage stuff and have a baby to knit for, then I definitely recommend this book. There are a couple of items that I think look a little too dated for my tastes (the Dewey Cabled Pullover comes to mind), but overall I think these patterns would look great even today. 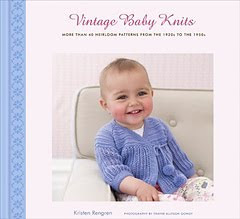 Vintage Baby Knits is published by STC Craft. You can get your copy on Amazon for $18.15. So, get any good knitting books lately? So, I was just thinking the other day that it has been about six months since Sock Summit. Man, was that ever a good time. Anyway, I was thinking about all that yarn I bought and was wondering if it was all still in the stash or if I was using it up in a timely fashion. 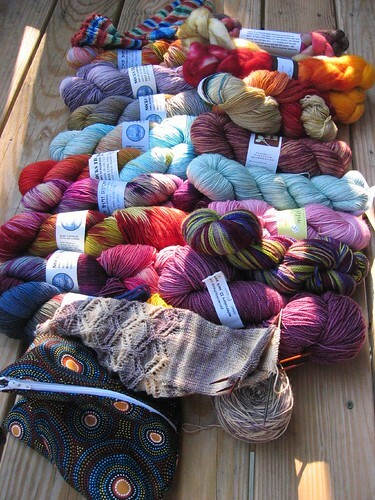 So, first up, as a reminder, here is the haul from Sock Summit: Yeah, that is the most yarn I have ever bought at once. But, it was worth it. Again, such a good time. Anyway, here is a lovely mosaic of some things I have finished with the Sock Summit Stash: So, I have used up three skeins on one skein lace shawls, two skeins on socks (which, to be honest, I knit while at SS), one skein is currently being used in some Froot Loop Socks (more on those later), and a wee bit of a skein was used for the kid socks. So, did you go to Sock Summit? 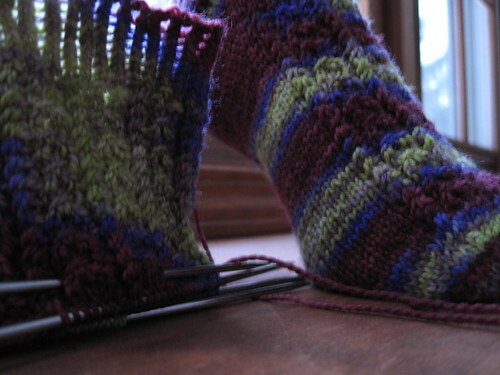 Been knitting up that Sock Summit Stash? 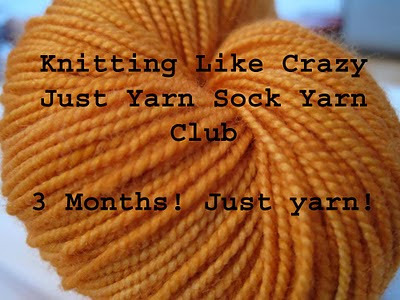 Just a reminder that there are still 11 spots open in my Just Yarn Sock Yarn Club! 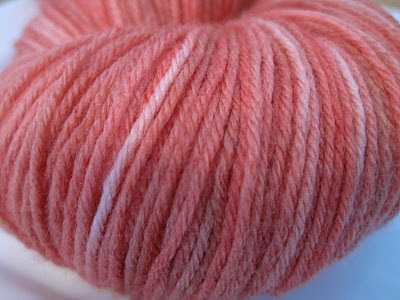 The shipment will include a different base yarn each time. 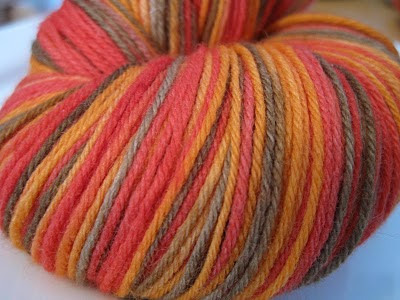 One shipment will contain Insanity Sock, which is a 100% superwash merino yarn, 420 yards, per 4oz skein. 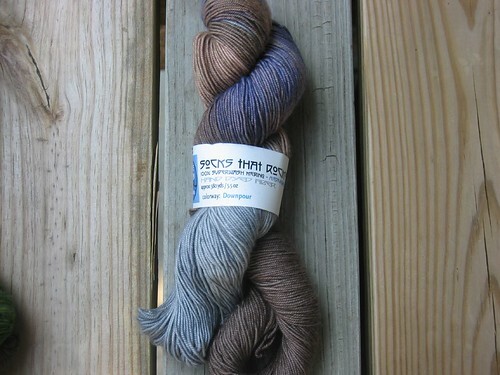 One shipment will contain Treehugger Sock, which is of 65% Superwash Merino /35% Bamboo, 500 yards per 100g skein. One shipment will contain my new Crazy Cash Sock, which is 80% Superwash Merino/10% Cashmere/10% Nylon, 420 yards per 100g skein. To sign up, check out my listing on Etsy: http://knittinglikecrazy.etsy.com. Or you can email me at jenATknittinglikecrazyDOTcom, and I will send you a Paypal invoice directly. I will be closing sign ups on 2/20 or when I have the 15 spots filled, whichever comes first! 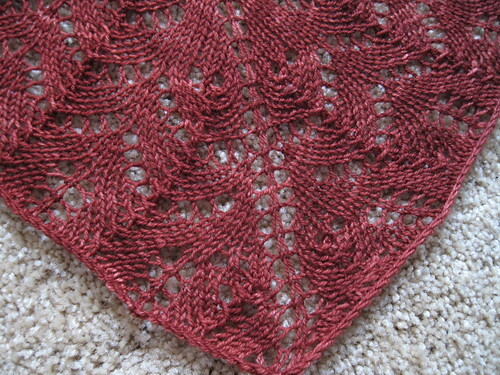 As I discussed last Wednesday, I have been taking Stefanie Japel's online Design Your Own Shawl class. 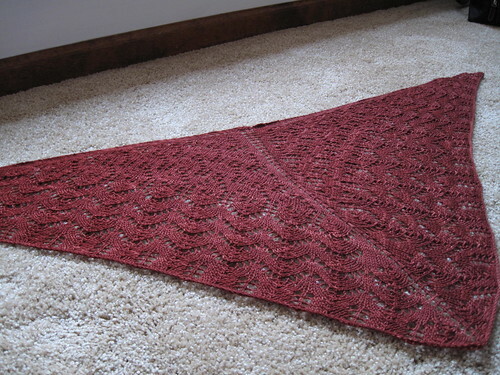 Well, last week I finished up the first shawl I have ever designed myself! I could not be more excited! I really do love how it came out. 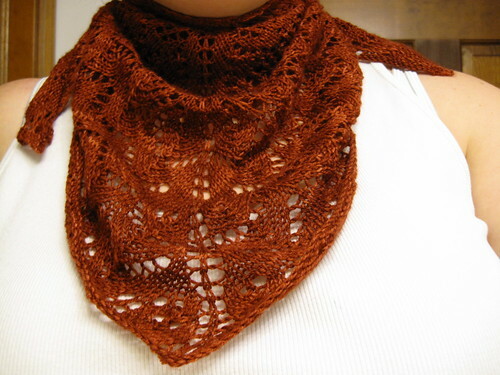 I feel like it is a very good first shawl in terms of my designing. I have been getting good feedback from the knitters, which makes me feel good about getting it all ready to go and available as a free Ravelry download at some point in the very near future. So, now what's on the needles, you ask? Well, a second shawl of course! I got hung up on some math with the first one, so I worked out the kinks and am knitting away on the second one. Hopefully I will have that one to show off soon too. I have to say this online class has been such a great thing. The handouts alone are worth it. And, I will be providing a more in depth review in coming weeks (of course! ).